My mother’s birthday is coming up in a little over a week, so I figured it be nice to make her something. Today was an especially perfect time to do so because I always end up being too busy to make her anything when it’s October. By then I’m usually too busy with school! Today, on the other hand, was barely my second day of school, so I figured now would be the best time to relax a little and get back to my crafty side. The idea came to me after I finished a box of cereal. Not wanting to throw it away, I looked at it and thought of what I felt like making with it. I didn’t feel like making anything too complicated, so I decided to make a mail holder. 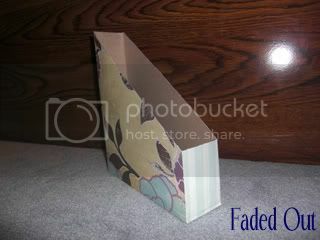 The cereal box was a little too small to fit any papers or magazines, so mail envelopes would work best. 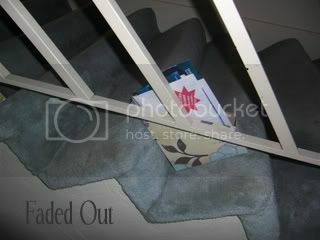 At my house we tend to sort the mail (or not) and leave it in piles on the edge of our stairway for my mom to pick up and bring upstairs to her room. Sometimes they just sit there for a long time before my mom has time or remembers to take a look at them. After a while the piles look a little messy even if they’re nicely stacked on the stairway. So I figured it’d be perfect to stick a mail holder right at the edge of our stairway to organize things a bit! Cut diagonally along the cardboard cereal box (with or without using pencil marks and rulers; it’s up to personal preference). haha. Very easy. 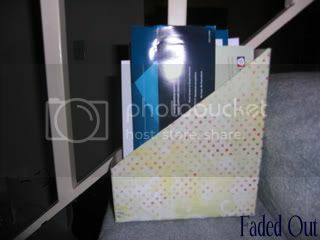 Great way to use up your cereal boxes to store papers, magazines, mail, etc. However, since this is going on our stairway and it’s also a small gift to my mommy, I decided to spruce up the box and cover it with lovely paper. The huge pack of beautiful stationary I bought was on sale at Michaels (I had a 40% off coupon). I love that pack and it always makes me excited to do something with it. Covering the box with paper is probably self-explanatory but I do have some tips. Somehow it took me forever to finish it up, but I suppose it was because I wanted to be thorough and because of the paper I had. Use Mod Podge as your glue. It does a terrific job of keeping everything looking smooth and it secures everything very well. Get an old credit card that you don’t use anymore and use that to smooth out the paper after glueing it down. You can also use it to wipe up any excess glue that is pressed out and wipe that off on a tissue. When glueing paper down on each side, leave a bit of an overhang that will glue down over the edge onto the other side. This ensures that your holder will look really smooth and continuous, and so that none of the cereal box will show through the edges. I found it easier to cut an approximate size, glue down the paper, and then cut off any excess paper with an X-ACTO knife. Using nice paper can turn a cheap looking cereal box into a lovely looking holder that could probably pass off as being bought from the store! 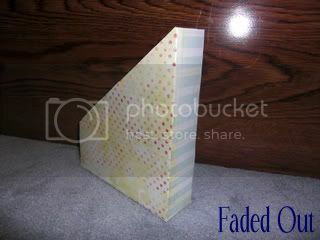 You can also change it up by gluing a collage of pictures instead of just using paper to cover the box. I think the most time consuming thing for me was gluing the paper onto the box and cutting it with the X-ACTO knife. I overlapped the pieces so that it would look nice and so that nothing would show. It took a good chunk of time doing that. But it looks pretty nice, don’t you think?